According to PWC report, 71% of respondents would rather use their voice assistant to search for something than physically typing their queries. And what’s most important is that the differences between spoken and typed queries may cause different SERP results. Which in turn means that your competitors’ voice search optimized websites have better chances of engaging your potential customers or subscribers. Want your website rank as high for voice queries as for the typed ones? This article will give you the six key steps to undertake for 2019. Remember when voice search required calling a phone number from your mobile device and saying your search query? That was what voice search looked like in its infancy (to be more precise, in 2010). And to little surprise, few people actually used it. Since then, voice search has improved significantly. On June 2011, Google announced they were starting to roll out voice search on Google.com. At first, the feature could be accessed only in English. Today, we have a choice of about 60 languages supported by Google Voice Search. With the Hummingbird update in 2013, the concepts of typed and spoken search changed a lot. The updated algorithm emphasized natural language processing and was aimed at considering the users’ intent and the context of the query. From then on, search questions structured in sentences have returned more relevant answers. With voice search, people typically ask a long question as they would normally speak. Hence, the Hummingbird update gave a huge push to voice search optimization. Why do we need to optimize for voice search? Experts differ on their opinions about voice search optimization. However, most all of them agree that it’s an important part of the SEO process. We spoke with Jenny Halasz, speaker and consultant on SEO, and Shane Barker, digital marketing strategist, to get their insights on voice search optimization for 2019. “Facilitated by the launch of voice-based digital assistants like Siri and Alexa, voice search now constitutes a significant part of all online searches. And its share is only going to rise to a level that SEO experts can’t deny its importance. The question is, who will be best prepared when voice search takes up a majority share of all searches? And the answer to that is SEO experts who are devoting their time to it now. So, start learning about the nuances of SEO for voice search. That said, don’t go overboard and hire a team for it — at least not yet. The best place to start? Learn about Google’s Hummingbird and other algorithm updates and how they’ve changed the dynamics of SEO. Typed and spoken searches will output different results. Which means that optimizing your site for a traditional search doesn’t always look the same as optimizing your site for voice search. The most significant concern about voice search? People using voice search on mobile will get only one top result. This one result is affectionately dubbed “position zero,” and everyone wants it. By 2020, half of searches will be conducted by voice. So by 2020, half of your potential customers won’t see your website even if you’re fourth in the SERP. Ranking number one — or securing position zero — will be the main goal for every business owner. Featured snippets matter because up to 30% of 1.4 million tested Google queries contain them. 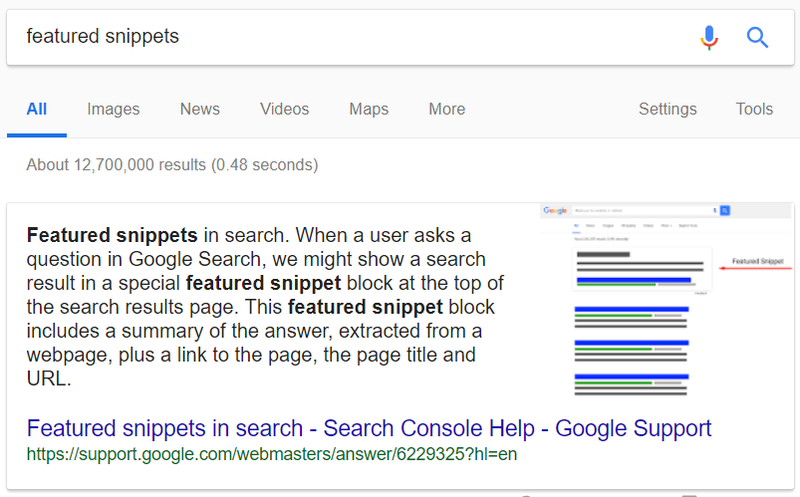 You can be sure that if the results include a featured snippet, your voice assistant will pull its answer from there. So if you want to rank in voice search results, you should focus on providing such quality data that Google displays it in the featured snippet. When people search for your website, do they want to buy something or are they looking for information? User intent tells us the the reason a person typed their query into a search engine in the first place. Sometimes intent is obvious and clearly expressed in the query with words such as “buy,” “price,” “how to,” “what is,” etc. But other times, intent hides only in a user’s mind. Intent may or may not be expressed. Regardless — thanks to the Hummingbird update — Google digs into the context of the search query. They investigate sites’ content and provide you with whatever answer is deemed most relevant. In the most likely scenario, I’m interested in the most recent awards ceremony — not in results from 20 years ago. Search engines understand this, and take it into account. Therefore, you should consider user intent when creating content, in order to enhance the relevance of your pages to specific search queries. So if you want to optimize your page for a featured snippet, your main aim should be understanding user intent and giving your audience an immediate answer. When searching for information via voice assistant, people behave as if they’re talking to a human. Most of us won’t use short, choppy keywords. We’ll ask questions and use long phrases. By the way, using long tail keywords is good practice not only for voice search optimization but also for traditional SEO. In fact, key phrases containing more than two words face less difficulty (or competition) and provide higher chances to rank at the top. As I’ve already mentioned, people tend to use questions for voice search along with long phrases. Voice query, on the other hand, sounds much more natural. To find out what questions your target audience may ask (and not spend too much time doing it), you can use tools such as Answer the Public or Serpstat Search Questions. Disclaimer, I work at Serpstat and thus am obviously more familiar with the tool. Using our tool, for example, you would simply type the word or a phrase best describing the subject of your content. From there, you would be shown how people usually search for that topic. When you choose the questions you’re writing about in your post, add them to the pages around your site. You can also create H2 headers using these queries and provide answers in the body text. Answer the questions concisely and make sure the main idea is stated briefly. After you answered the question directly, you can also cover other related search questions. This helps you rank for as many variations of queries as possible. And to not lose your position in featured snippets, keep your content fresh and update it regularly. Page speed means the time needed for your page to load. This also influences whether or not your page will appear in voice search results. Picture a person using voice search — they’re likely on the go and/or in a hurry. So to reach those searchers, page speed optimization really is high priority. As a first step, analyze your current website speed with PageSpeed Insights. This tool tells you whether your site’s current loading time is fast enough, and suggestions for how to make it even faster. Note as well that mobile speed is more important than desktop for voice search optimization. This goes for overall design as well — make sure your website is mobile-friendly since a majority of voice searches happen via mobile devices. Structured data is code added to HTML markup and used by search engines to better understand your site’s content. Using structured data, you can help search engines crawl and read your content efficiently. With schema markup, you can better control the way you provide information about your brand, and the way machines interpret it. Implementing structured data results in rich snippets which are known to increase click-through rate, drive traffic, and bring you competitive advantages. Having this data can also help your pages appear in featured snippets and, consequently, in voice search results. Specifically, you can use structured data markup to provide better information to mobile devices about your website and its content. To find out how you can implement structured data to your site, use Schema.org vocabulary. They have a set of schemas which enables SEO experts to markup their websites. When elaborating structured data, you should remember it’s easy to become spammy. Use the data which is relevant to the content you provide. And finally, keep updating your markup, as everything tends to be constantly changing. As we all know far too well, websites are never finished. A BrightLocal report found that 58% of consumers use voice search to find local businesses. This comes as little surprise, since most people use voice search when they’re walking or driving somewhere. Mostly though, people use voice to discover where they should go. People who search for “best donuts in LA,” are looking to discover donuts near them. If you own a donut shop in LA, then, you want to include your city when optimizing keywords. This also stays true for states, neighborhoods, and even countries where your business works. In this case, the search engine will use my location to understand which cafes are closest to where I am at the moment. To appear in the relevant results for such queries, though, you don’t add the actual phrase “near me” to your content, of course. Rather, most search robots use Business Listings information. To optimize for Business Listings information, you would need to go to your Google My Business page. On there, make sure you’ve added all the necessary information, such as brand name, address, opening hours, etc. People already use voice search widely — and its popularity will only grow dramatically in the coming years. Those who already take voice search optimization into account in their SEO will improve their content visibility significantly, as voice search results increasingly narrow results to only top pages. While it may seem ominous now, the future with voice search is clear. These six steps to voice search optimization will help you prepare to stay on top.